The Logitech G502 HERO is an update to the G502 series that has kept much of what made it popular the same. 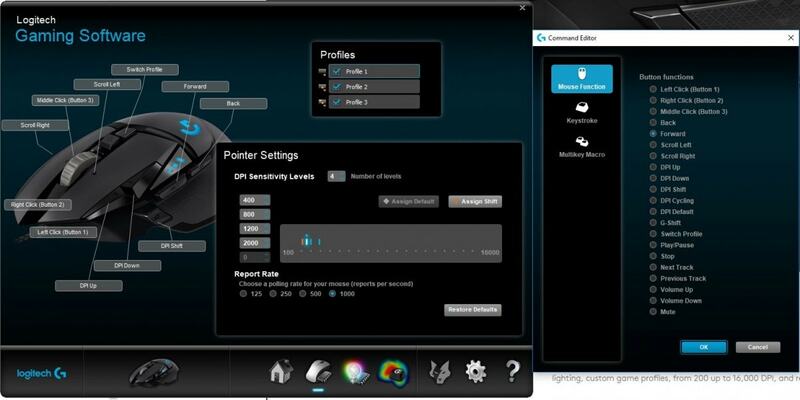 While the new HERO sensor still performs flawlessly, the G502 has always had a flawless sensor. 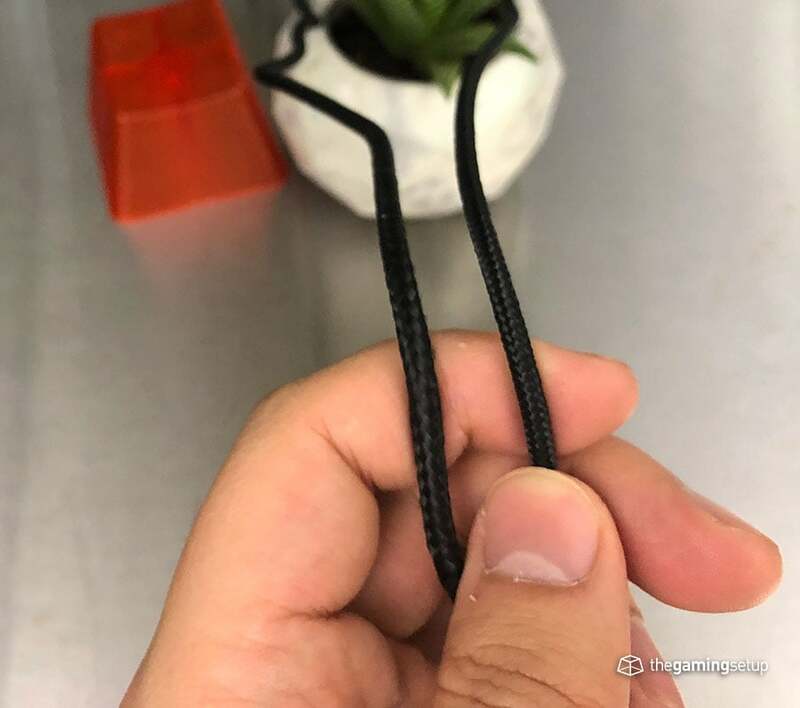 The cable is now thinner and more flexible. The infinite scroll also seems to be able to scroll for longer periods of time. Outside of those changes, this mouse still feels like the Proteus Core and Proteus Spectrum, I’d actually recommend getting those mice if you like the G502, they’re cheaper and the performance and gaming experience will be roughly the same. 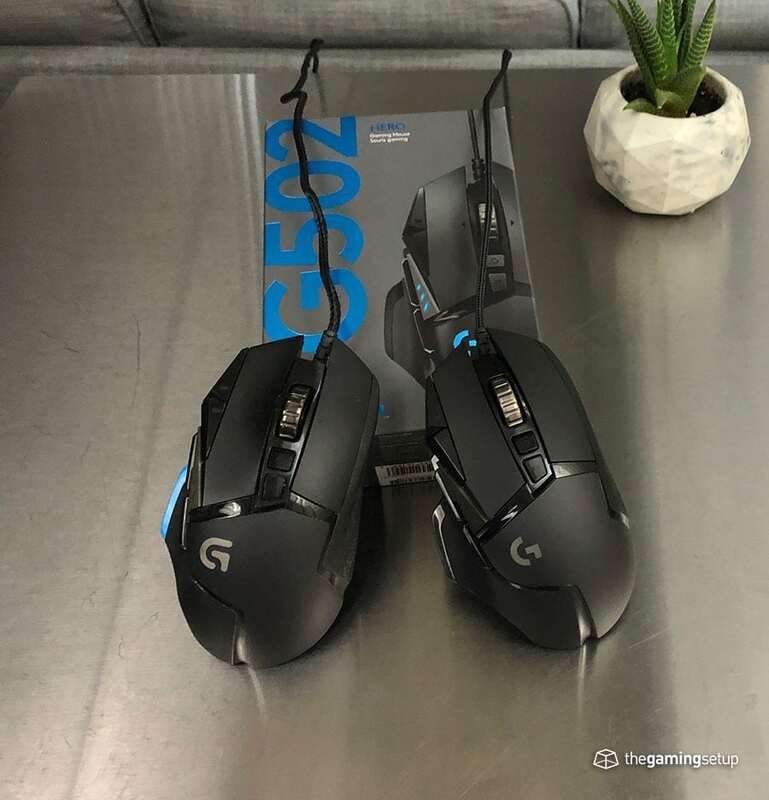 The G502 line as a whole one of our picks for best cheapest gaming mice, it provides a lot of functionality for a reasonable price. This big boy is still around and it still has a great comfortable ergonomic shape, great buttons and a flawless sensor. In all likelihood you’re familiar with the shape of the G502, it’s a classic shape that’s been around for years, the best selling gaming mouse of all time. 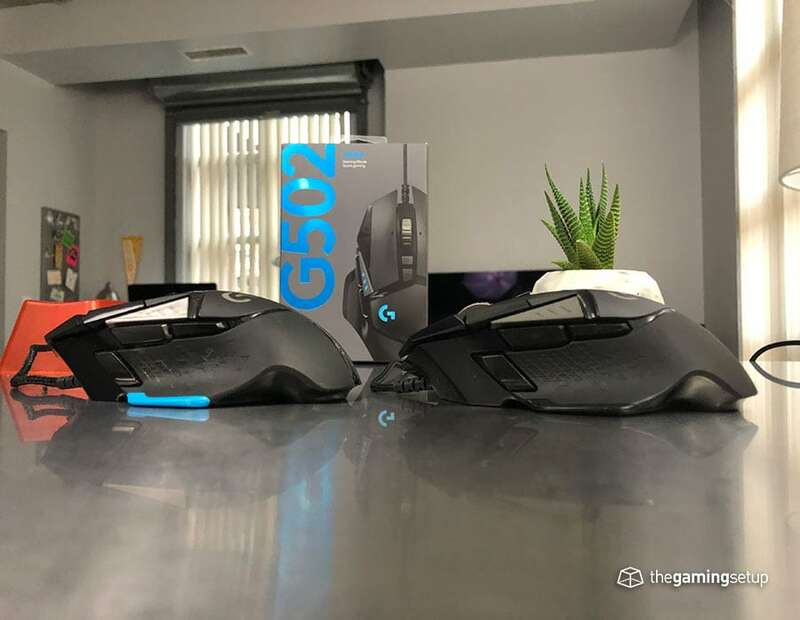 If you’re not familiar, the G502 HERO is an ergonomic mouse, the mouse is a heavyweight coming in at 121 grams with the option of adding more weight via 3.6 gram tuning weights. If you ever lose those weights you can order replacements off of Amazon. 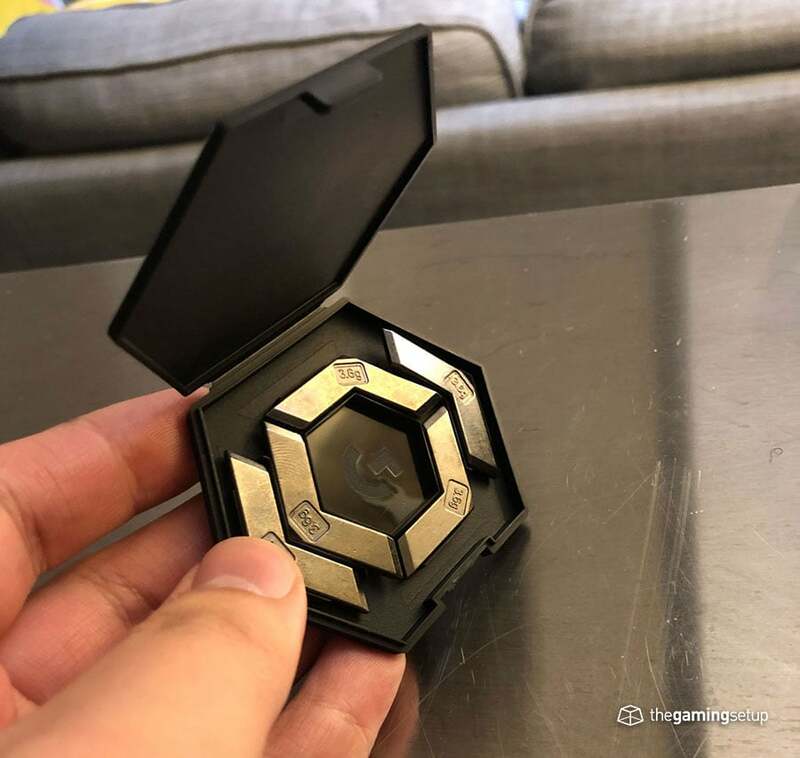 Dimensions very similar to the Finalmouse Air58/Phantom series, don’t let the wide width fool you, the base is wide but the actual grip width is a more familiar 62 mm. So if you find mice like the Finalmouse mice and Rival 600 to be a good fit for your hand size then the G502 should be a good bet. The shape itself is very comfortable, with a wide base, grippy rubber material and deep comfort grooves on the side. The hump of the mouse is average, not as tall as the G703, while not as low to the ground as the Zowie EC mice for example. A soft touch, matte plastic is found on the mouse wherever there isn’t a rubberized grip. The front of the mouse slopes slightly, not as dramatic as we’ve seen on other mice, this will usually result in a flatter hand shape when palming the mouse. Coming fresh off a review of the Air58 (review here) this mouse definitely felt a little brick-ish on first use. With more extended play I was getting acclimated with the weight of the mouse, though I will admit I personally play better with a lighter mouse. No discomfort after longer gaming sessions, you can definitely play well with a heavier mouse but I would recommend the G502 only for people that know they like the heavier weight. You can find good shapes and lighter weights in other mice. The shape of the newly updated G502 Hero is exactly the same as the Proteus Core and Proteus Spectrum, so if you’re simply looking for a replacement for your older mouse, then you’re in luck. 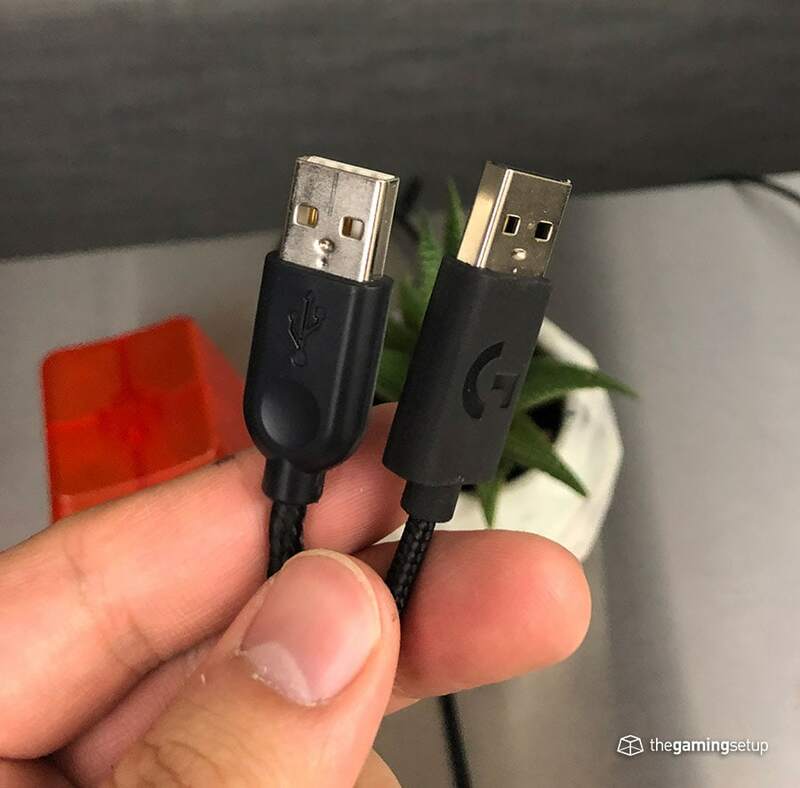 The cord however is an a huge improvement over the older versions of this mouse, the G502 Hero features a significantly softer and thinner braided cable. The new cord is better, but it’s still kind of stiff and definitely not as soft and out of the way as the Air58 or the Rival 600. A mouse bungee is definitely recommended for the G502. On the underside you’ll find 3 large feet and one small foot to the top left of the sensor, the glide on these feet are very good and works well to help minimize the weight of the mouse as much as possible on my control mouse pad. The G502 Spectrum Core that I bought years ago is still truckin’ today, completely working, not skipping a beat and not a single double click. 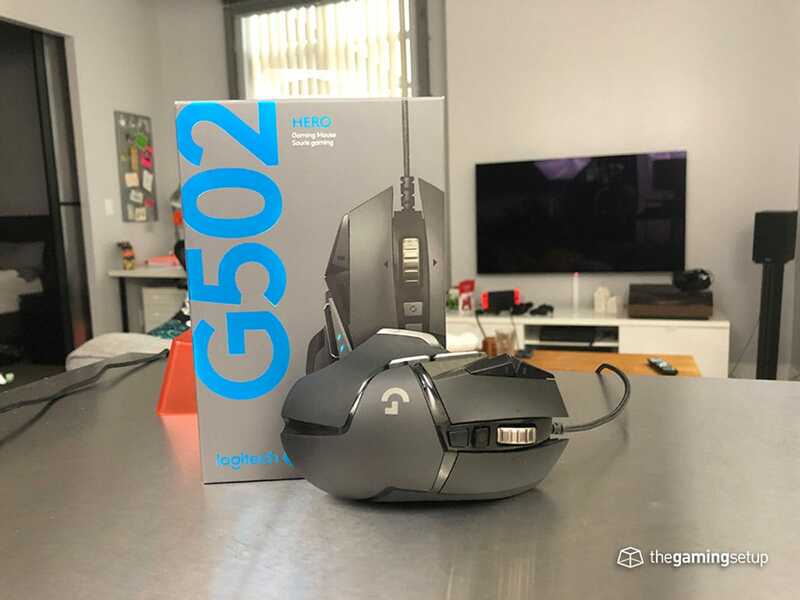 From a few days of playing with the G502 Hero, I wouldn’t suspect any change in build quality, no noticeable creaks or weak spots. The mouse wheel does rattle when shaken but that is a function of the design of the side clicks on the scroll wheel. The G502 has a ton of buttons, it makes it a good candidate for games with a lot of keybinds or just general productivity. All of the above buttons can be re-mapped or assigned to a macro, the G502 allows for an insane level of customization with your mouse gameplay. The G502 uses 50 million click rated omrons for their main buttons, the main clicks feel good, responsive and clicky, not as tactile as the clicks found on other popular mice like the G305, G703 or Rival 600, but not a bad experience either. All of the additional buttons are placed well, you’re not likely going to accidentally hit any of them by accident. I had some difficulty hitting the sniper button which is found at the front of the left side of the mouse, my thumbs are average size and I grip with a bit of a hybrid, so a palm user or someone with bigger thumbs might find more use out of that button placement. The clicks for the extra buttons is solid, tactile and easy to locate. No issues responding with a quick melee or spam clicking with the side buttons. The scroll wheel on the G502 is very unique, it’s a little bit looser than your average gaming mouse. The scroll wheel itself is made of plastic with large notches cut out for texture. The steps are well defined when scrolling and are on the loud side when scrolling quickly. 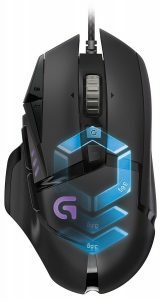 The G502 features the ability to tilt click left and right for additional inputs, I’ve seen some cool uses of the tilt clicks in Fortnite to help speed up building, something you just can’t do on most mice. On top of the tilt clicking, the G502 also has an infinite smooth scroll wheel, similar to the one found on the G903. The G502 HERO infinite scroll wheel spins for much longer in my testing, there aren’t really many gaming applications for this improvement, but there could be some productivity improvements from being able to scroll faster for longer. 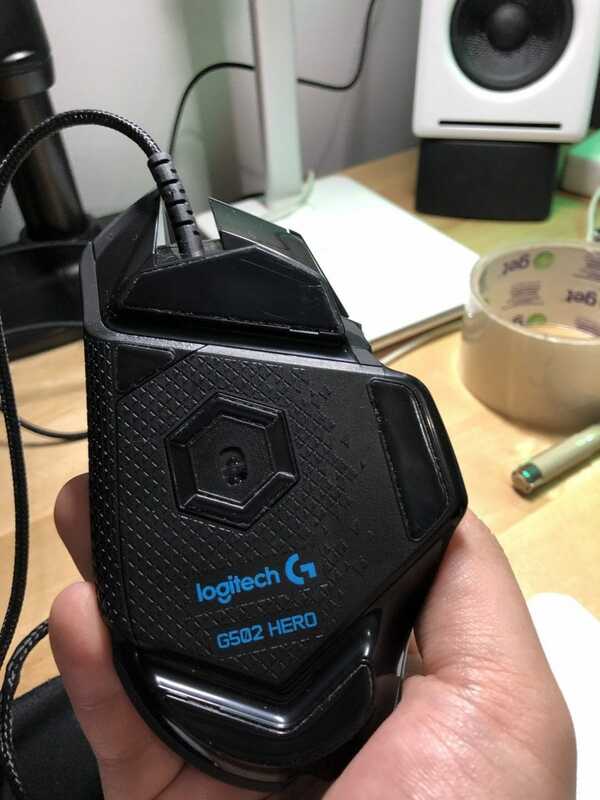 One of the main changes between the G502 Hero and the previous iterations of the G502 is the change of sensor, the G502 Hero uses the Logitech developed HERO sensor replacing the more common Pixart PMW3360 found in the Proteus Core and Proteus Spectrum. The HERO sensor is known for providing accurate tracking, no acceleration, prediction or smoothing with really great power efficiency. The power efficiency matters much less on a wired mouse. 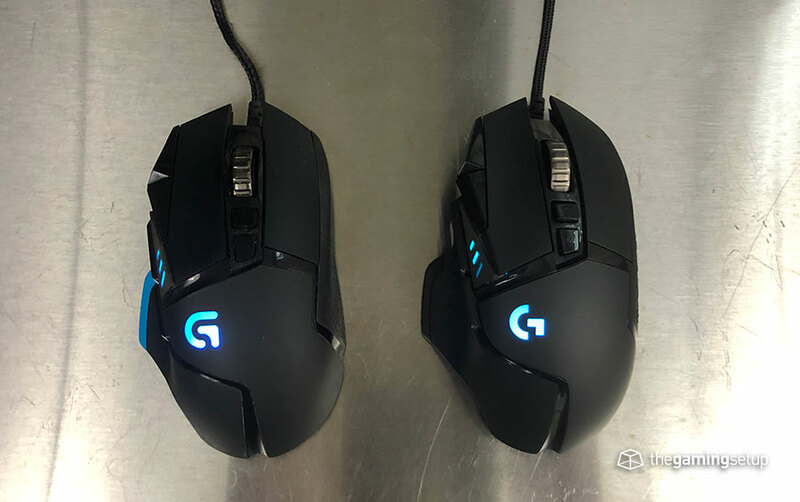 The actual difference with switching sensors is minimal, all versions of the G502 have great tracking and I wasn’t able to tell the difference in normal gameplay. The HERO sensor has options for DPI from 100 to 16000 and has the following polling rate options: 125 / 250 / 500 / 1000. There’s no reason why you wouldn’t want to use the 1000 Hz polling rate here. The RGB is very minimal on the G502, the Logitech logo is illuminated, this logo has changed from the Core to the Hero. The mouse has onboard memory to save up to 5 customized profiles with the ability to quick switch profiles if you have specific gaming setups for each game. The G502 features a weight system, allowing you to add more weight to its 121 gram frame. The weights go into the bottom of the mouse surrounding the sensor. The core stand out feature of this mouse is all the buttons you have access to, other than that, everything else is pretty standard. The Logitech G502 is backed by a 2 year warranty. Logitech’s warranty is usually superb, my G403 scroll wheel started to act randomly and Logitech replaced the mouse with a G703 very quickly. You can buy with confidence when dealing with Logitech products. My old G502 is still trucking, it’s survived hundreds of hours of sweaty young adult gaming, the only thing that’s actually wearing on the mouse is the side rubber grip, not as grippy as it used to be but very serviceable. 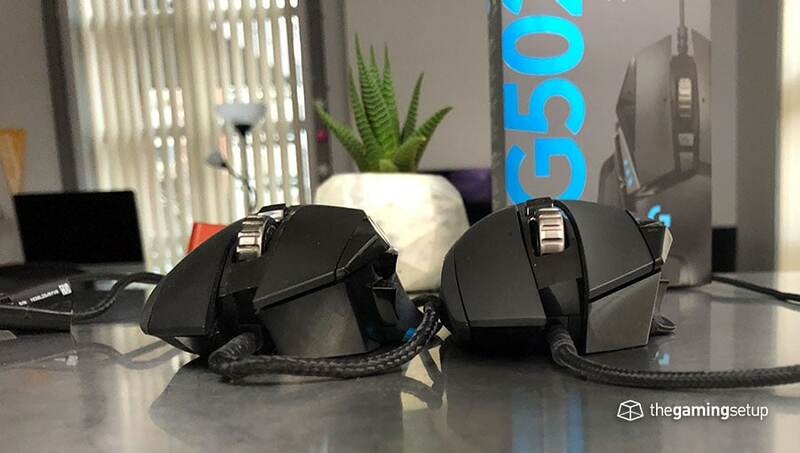 Not much has changed with the G502 Hero from its previous iterations, here are the main differences. So if you want to save money and can live with a thicker cable, I’d go with the Proteus Core version of this mouse, if you were thinking of upgrading from an older version of the G502, I’d say wait until the old mouse is really falling apart because the new version isn’t that different. All that being said, this is still a good mouse, but I feel like it’s made specifically for people that are really used to this shape and weight and don’t want to change to other shapes. The G502 has a top sensor, has a great shape and great buttons. It’s built like a tank, the mouse will likely last a long time and you’ll get some good gaming done with it. 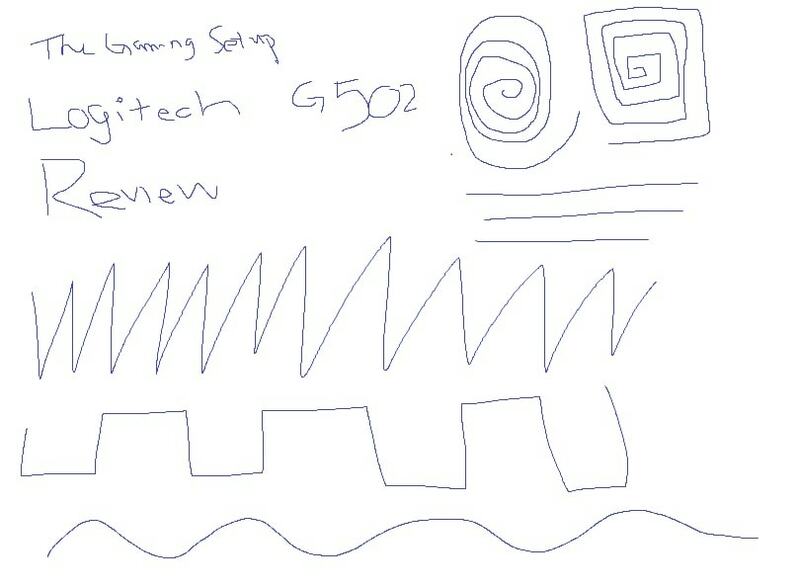 At its price point, its still a very good value, the G502 does find itself on our best cheap mice list.